The Galaxy S6 is expected to be officially announced by Samsung next month during its event at the MWC 2015. There have been several leaks and rumours in the past, shedding the lights on its hardware as well as software, but we think that this might be our first real look at the upcoming Galaxy S6’s original design. As you can see, the render shows curved edges (not to be confused with the curved edge screen) on the Galaxy S6, similar to that of the Apple iPhone 6. The home button appears to slightly taller and circular when compared to the home button on the Galaxy S5. The headphone jack and the microUSB port are at the bottom, while the proximity sensor, ambient light sensor, and the front-facing camera seems to moved from the right hand side of the earpiece to the left hand side. The volume buttons are on the left hand side of the device, and they are not separate buttons instead of a single large one. Every Apple fanboy whining “hurr iphone 6 look”. This is N7000 look. 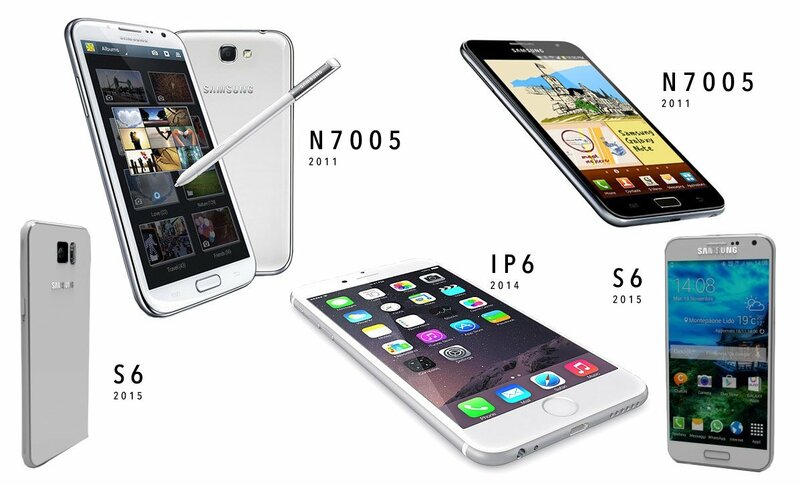 It wast long before iP6 – if someone copied, then it’s Apple. Well now if that turns out to be real, I can’t see why Apple suing Samsung would be wrong. iPhone 6 and S6 all looks like… Yep, the Meizu phones. There’s an indent on the sides, if you didn’t notice. So, it’s not like an iPhone 6, more like a Note 4 with rounded sides. The iPhone has a great design, so i cannot understand why you people complain about it. An iPhone with Android is what many many people (including me) always wanted! 😀 Very nice Samsung! The iphone 6 has NOT a great design. All the iphone before were tooo edged, they were all just Bricks! Now the iphone 6 is tooo round. It has no characteristic at all!!! I would be really disappointed, if the above posted design would really be the final Galaxy S6! I really like the design of the Galaxy Alpha or Galaxy Note 4. It should go further in this direction. Finger crossed! LoL Iphone fans here. Guys wrong website. Haaaa! It could be a copy of the LG G3, or the S5, or any other phone with rounded edges. My point is that this phone looks like any other damn phone. What do u guys want? A phone with 6 corners? Or sharp edges? I guess you never seen Galaxy Note N7000? Which looked exactly the same (round bezel), just was thicker on the back? It’s really weird… Seems fake to me..
It’s a 3d mesh without a texture, genius. It looks like every other damn smartphone. All smartphones are rectangular with little curved corners. Where have you been last 10 years?? There is nothing special in S4 that makes it look different from any other phone. WHERE IS THE PROJECT ZERO????? WHERE IS THE NEW DESIGN????? I HOPE THIS IS NOT THE S6! Lets see, Samesh*t ruins itself since S3 launch with that “our design is perfect” idea, every year we see spectacular renders or hear emotioning rumours about a serious design change, and finally is just the same sh*t, so this horrible design matches with samsungs horrible business, it must be a leak, could be even worse when presented hahahah. Oh, forgot to mention that you must compare recent news about cases for the S6 on this website, look over posted pics about cases for the S6, they even show the phone, you can see that the headphone jack is placed in the same place as shown on this case rumours… come on, you know how it really ends, deceptioning customer to the core! Jeesh why you got so worked up lol. I could do this in a heart beat with a 3D printer lol. I dont think it will like like that. Edit: I don’t think it will look like that.